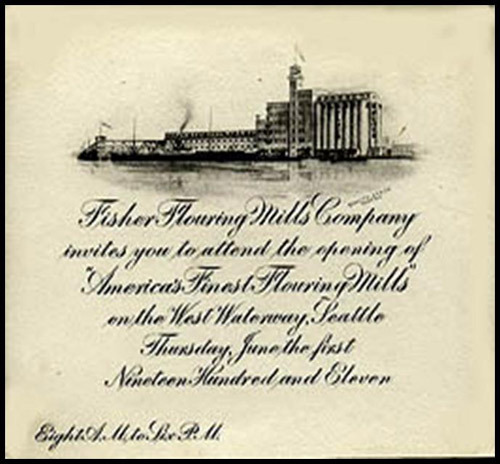 Recently, Fisher Flouring Mills celebrated their 100th anniversary. Why is this of interest, exactly? Because, for anyone who has ever attended the epic Puyallup Fair in the Seattle area, you may know them as the makers of the famous Fisher Fair Scones. 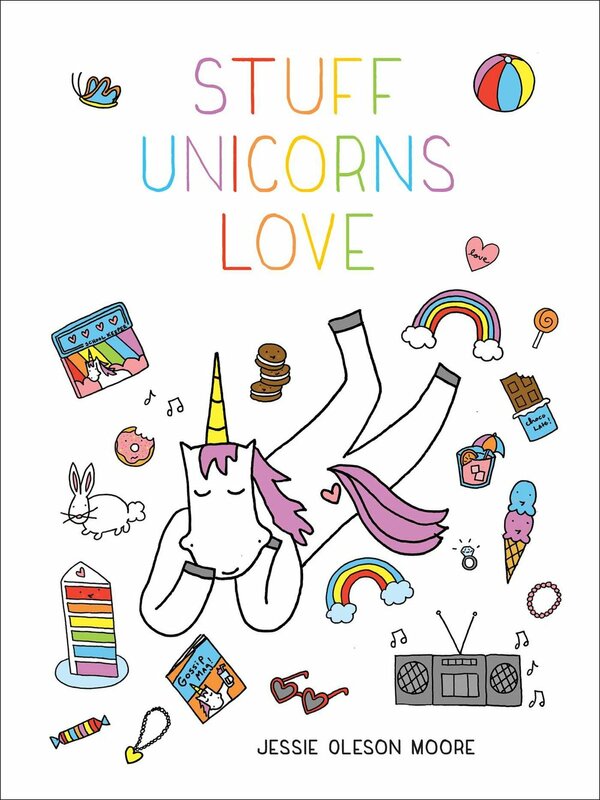 Let's take a few minutes to learn a bit of the backstory behind this company and their signature product, shall we? I'd like to thank Nick at Team Soapbox who was so helpful with getting me much of this information. The Fisher booth in 1923How did they start making scones as a fair food? William H. Paulhamus, president and general manager of the Puyallup Fair (Western Washington State Fair) pitched the scones idea to Fisher and said he’d donate jam made from his raspberry farm in Oregon. 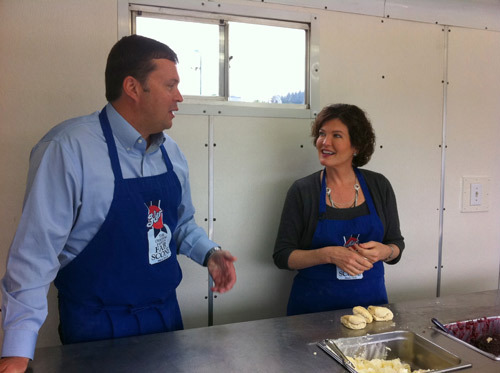 The scones debuted at the fair as a chance to showcase and promote the company's flour flour. They were a success, going for just a few pennies each. Today, they are still a Northwest favorite and a tradition of Washington fairs. Michael Maher began with the company in 1978 (then Fair Scones, Inc.) and has risen up the ranks as the company has grown over the past 30-some years. Current CEO MikeHow did current CEO Mike rise to floury fame? 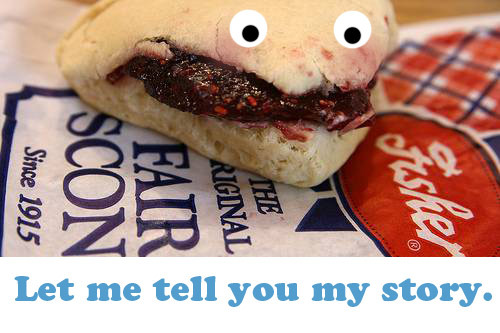 Mike’s career began as a high school student in Portland, OR when he was hired by Fair Scones, Inc. to work its concession booth at the Rose Festival. From 1979 to 1984, he worked summers as a concession manager, operating various events in Oregon,Washington, and British Columbia. After graduating from the University of Oregon in 1985, he came on board full time as the general manager, overseeing all festival operations. In 1995 Mike became vice president—operations and directed the company’s expansion into retail scone products and wholesale baking to the airlines. In the late 1990s Mike led three specialty food company acquisitions and expansion into private label products. He was named president and COO in 1999. He joined the Board of Directors in 2003, and was later promoted to his current post as president and CEO. 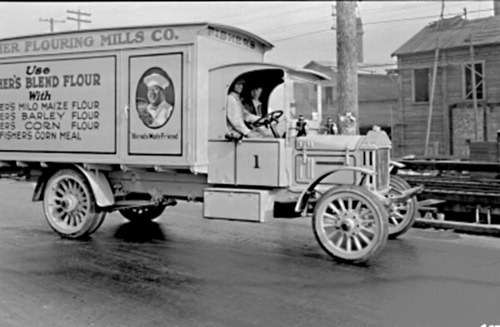 Old Fisher Flouring Mills truckHow did the scones gain such popularity? What started as a promotional tool eventually expanded to became a signature food item at 39 fairs and festivals throughout the Northwest, but the company is still family-owned (and even the Fisher family still has a stake in the company) committed to local community. Today, Fisher owns the raspberry farm in Oregon and still uses the same simple jam recipe (berries, sugar & pectin) to accompany the scones. The scone recipe has remained largely unchanged, except for a few tweaks to the salt and sugar amounts to accommodate modern tastes. The scones represent the company’s commitment to a tradition of local, Northwest deliciousness by utilizing local ingredients and tastes—showcased at local fairs. This commitment has now come full circle in a world where people are thinking and shopping local. 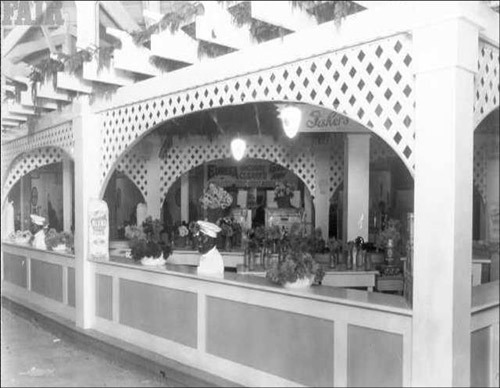 Fisher Scones debuted at the 1915 Puyallup Fair, in the very same corner booth under the grandstand where they are still sold today. The scones originally were free or just a few pennies, promoting Fisher Flours. 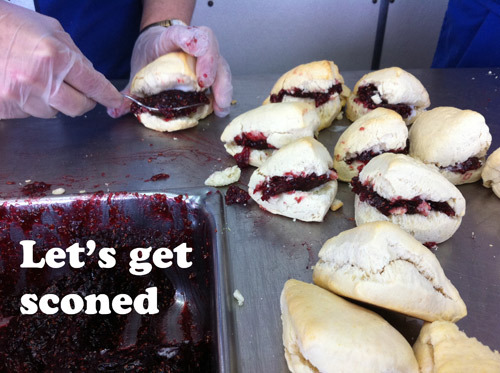 Today, Fisher serves up more than 40 tons of raspberry jam each summer to top the scones. This fall, Fisher will serve its 100,000,000th (yes, one hundred millionth!) scone at the Puyallup Fair. Mike Maher, Fisher’s CEO started out by making scones at the fair himself. Mike’s been with the company three decades. Nobody's sure how many scones he’s eaten. Fisher supports Northwest farmers through a partnership with Shepherd’s Grain, a cooperative of 33 local farmers who use sustainable agriculture farming methods. They’re also connected with the Food Alliance of Oregon, which provides the most comprehensive third-party certification for social and environmental responsibility in agriculture and the food industry in North America. For almost 100 years, Fisher Scones have been a tradition at fairs and festivals throughout the Northwestern United States. These triangular shaped biscuits, baked fresh and smothered in honey-whipped butter and tart raspberry jam, have created unparalleled loyalty. Scones can be yours year round, at home. Fisher brand scones are available by a home mix line; on the mix subject, this year, the company plans on introducing new packaging for the scones (and new all-natural Pancake & Baking Mix, Biscuit Mix, and Cornbread Mix). Want to continue getting sconed? Check out their website here, and find them on Facebook here.